All of the seven people arrested in connection with the killing of an investigative journalist in Slovakia have been released, police say. Kuciak, 27, had been investigating alleged political corruption linked to Italian organised crime in Slovakia. One of the men is an Italian who had done business deals with officials close to Prime Minister Robert Fico. On Friday, thousands of marchers braved freezing temperatures and held protest vigils across the country. 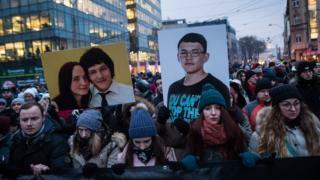 In Bratislava, marchers carried pictures of the dead couple along with a banner reading: "An attack on journalists is an attack on all of us." President Andrej Kiska led the protesters, said to number between 10,000 and 20,000, in a minute's silence. One demonstrator, Jozef Belovic, told Reuters: "There is a dirty mess all around here... and we common people have to put up with it." Some of the protesters at the peaceful march then moved to the office of Prime Minister Fico to demand the government's resignation. The murdered pair were due to marry in May. The funeral for Martina Kusnirova was held on Friday. She was buried in her wedding gown in a ceremony attended by hundreds of mourners in the northern town of Gregorovce. Kuciak's funeral will be held on Saturday in Stiavnik, close to the Czech border. In his investigation, Kuciak alleged that Italian businessmen with ties to the feared Calabrian organised crime syndicate 'Ndrangheta had settled in eastern Slovakia, and spent years embezzling EU funds for this relatively poor region on the border with Ukraine. One of the men he named was Antonino Vadala, who was among those released on Saturday. This is the first killing of a journalist in Slovakia's history.